Indian Railways is coming up with a new, state-of-the-art train which will have a glass ceiling and an infotainment centre to make the journey more enjoyable. construction of the coaches started in 2015, which are designed by the Indian Railway Catering and Tourism Corporation (IRCTC), Research Designs and Standards Organisation (RDSO), Integral Coach Factory (ICF) in Perumbur. “The first such coach is all set to roll out this month (October) itself,” said Dham Ghaj Prasad, Group General Manager (Infrastructure), IRCTC. Another three coaches will be rolled out in December this year. countries, like Switzerland, which enjoy the patronage of tourists. We believe such coaches would also give a fillip to rail tourism in India,” he added. He also said that other trains having coaches with aerial view will be decided later. The manufacturing cost of a single coach is Rs 4 crore, “The coaches will be ultra luxurious with rotatable chairs to provide the passengers an aerial view through partly glass ceiling,” describing the interiors of the train. 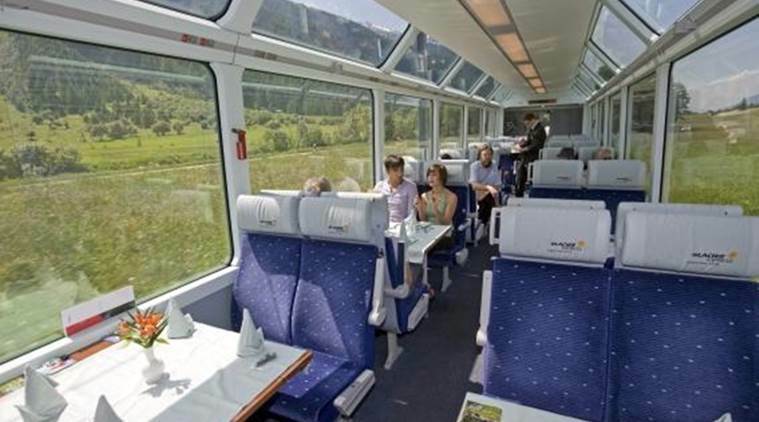 He further said that the coaches will have large leg room for a comfortable journey.